This fine piece of authentic Transylvanian artistry is ideal for a more civilized kind of vampire... i.e. the kind that doesn't look like they're on their way to a Calvin Klein photo shoot to sulk in a pair of tight jeans. No, with this finely crafted pendant, we have a more sophisticated customer in mind. 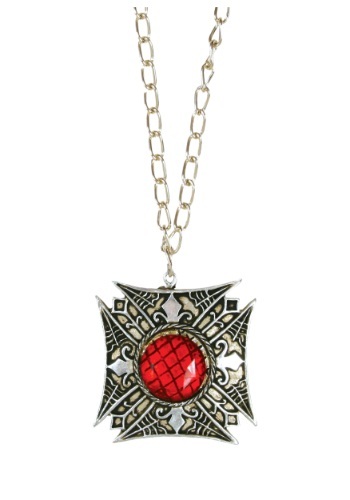 So if you're the type of vampire who lives in a historic home, wears cloaks with unusually high collars, and has old honorifics in front of their name (like "count"), then this exquisite Vampire Necklace belongs in your wardrobe! Like an heirloom that looks like it was bought at a European bazar by your great-great-grandvampire, the medallion has an intricate Old-World design with a hypnotizing crimson jewel at its center. Like the very eye of the devil, it will entrance your victi... we mean guests... before you even have a chance to use your powers!